Now you can see emails from any POP enabled email account within your Hotmail account. You can add any POP enabled Yahoo! 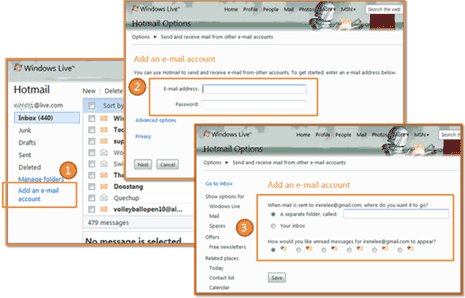 Mail (Plus), AOL Mail, and Gmail accounts to your existing Hotmail account for easy access. You need to enter login details of other POP email account in Hotmail to use this feature. To get started, click Add an e-mail account on the left-hand side of the Hotmail inbox. Then enter login details of other email address. You can choose if messages from other email account is shown in inbox directly on in separate folder for easy management. Click save and its all done. but i have not found this link on hotmail…. !